What Can We Do to Improve our Town? This entry was posted in Art, Arts/Crafts, Camp Estrella San Juan Cosala, Uncategorized and tagged Advice from kids on the environment, Camp Estrella, Camp Estrella 2017, Ecology, kid art, Kids, the environment, What we can do to improve our town on July 26, 2017 by lifelessons. Day one of Campamento Estrella (Camp Star) In San Juan Cosala, Jalisco, Mexico was a huge success. The point of the camp is to make each child feel like a star, and this year the counselors seemed to feel pretty happy as well. Art, poetry, dance, games, studying about the history of their town and how to improve it, kind treatment of animals and health and hygiene are all stressed this year. Friday will culminate in a performance and refreshments for parents and other family members. This is our third year for this camp. Thanks once again to Agustin for playing such a vital part as well as providing the garden area of Viva Mexico for us to use for the camp. Click on first photo to view all and read caption. Lost contact? Nope. “You put your whole head in!” The Hokey Pokey was a huge success, as you might have discovered while looking at these photos. This entry was posted in Camp Estrella San Juan Cosala, childhood, Children and tagged 2017, Agustin, Agustin Vasquez Calvario, Camp Estrella, Campamento Estrella, Children on July 24, 2017 by lifelessons. I was too busy this morning trying to get whiskers and rubber backstraps installed on all the masks to take many photos. Since it was raining and since I arrived first, I got soaked while pushing my umbrella handle up to remove gallons of water from the dangerously sagging roof of the canopy. Then I had 30 slightly soggy masks (from the humidity of the rain) to deal with in addition to the last rehearsal of camp songs before the dress rehearsal for parents tonight. Everyone else was equally busy running through dances and songs as well as finishing up on the necklaces and bracelets and gift boxes they made yesterday. The kids were rowdy from the rain and one little boy who just couldn’t stop raising trouble finally got sent home when he used a very adult word. (After countless warnings.) Lunch––hamburgers and French fries–– was a great success. Finally, at two, the kids were gone, we cleaned up the tables, with help I packed up 5 huge boxes and countess bags with art materials and I divided the “spoils” for two pinatas tomorrow–one for bigger kids and one for smaller kids. Then home to rest up for three hours before going back again for the dress rehearsal. And, wouldn’t you know it. One of my front crowns fell out!! If you can imagine me with pearly whites surrounding one black little upside down cone shaped filed tooth in the middle front of my smile–well, you’ll could see how well my day is coming along. Trying to stick it back with dental adhesive, I chipped the back of the crown, which means a nice $450 bill. Only money, no one died, it might still stick and save me the embarrassment of looking like my hillbilly background..All’s, well, okay with the world if not exactly right. Parents and family were invited to the dress rehearsal. The kids singing “La Llorena” along with Agustin nearly brought the house down! The girls were beautiful, the boys only slightly less rowdy than usual. Somehow, we got through the almost impossible task of herding 30 excited primadonnas through their acts. The girls bellydancing class that was an outgrowth of last year’s camp performed wonderfully and to loud applause. Then we served cookies and punch, everyone left, and because I wasn’t ready to go home, I wandered into Viva Mexico, the restaurant our camp site is the garden part of. Jere and DePaul and Rita were there, so I joined them. My tooth fell out again, so I ate soup, and after most of the other customers, save for four tables, had departed, Agustin serenaded us all. So sweet, and a woman tourist at an adjacent table was heard to remark, “I could live in this town. Imagine just living here and walking down that street to this restaurant.” We all agree, and that’s why we do. You’ll never have a finer tiramisu than at Viva Mexico. I didn’t think to photograph it until I’d nearly finished. Hey, it was soft and at the time I ordered it I had one barely cemented in tooth. By the time I ate it, the tooth had fallen out. One of the last four tables priviledges to hear Agustin’s fine voice and guitar. Fresh roses in front of a blowup from the cover of a magazine featuring students from a culinary institute who intern in Agustin’s kitchen. DePaul, the artist of the fine paintings you might have seen on the walls of the garden part of the restaurant where we had our camp. Of course all ideallic times eventually end, and this is what I returned to. 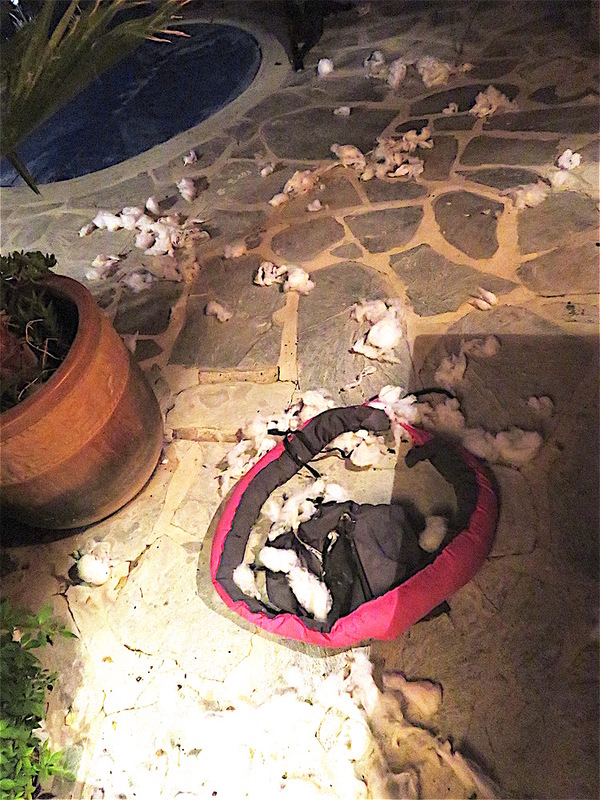 The last existing dog bed in the house, Morrie’s own, shredded beyond retrieval. Good Night! This entry was posted in Camp Estrella San Juan Cosala and tagged bad dogs, Camp Estrella, Camp Estrella 2016, Children, images of children, Images of children dancing, Morrie on July 30, 2016 by lifelessons. we find ourselves completely winded. back to rehearse our ending show. when, finally, we end the fray. but still, today, I’ve had too much. thirty are too much for me. we’ll do it all again next year. The Daily Post prompt today was Wind. This entry was posted in Camp Estrella San Juan Cosala and tagged Camp Estrella, Camp Estrella 2016, children images, humorous poem, photo of children on July 29, 2016 by lifelessons. Today was wild, with rain that caused huge waterfalls off the roof of the tent in the courtyard and caused squeals of joy from the kids, all huddled in the middle. First a visit by a dental assistant who talked about dental hygiene. I had found little kits in the states with a toothbrush, toothpaste and toothbrush holder as a gift for each child. Lots of noise later as they made bracelets and earrings and then little decorated gift boxes in case they wanted to give them to grandmas or mothers. Looked like most planned to keep them themselves. More dance, selection of whiskers for the dog and cat masks, a delicious lunch where, surprisingly, all of the kids at my table ate their vegetables first!!! Agustin thought he’d over extended himself when he bought two kilos (four pounds) of tortillas, but they all vanished. Never underestimate the capacity for tortillas of any local! Once the kids went home, I asked the Mexican counselors to stay to practice a poem I’d written for the parents. We’re doing a show for them tomorrow, then another show on Saturday for the crowd at Agustin’s restaurant. The other counselors drifted over to sit around the table with us, Agustin opened a few bottles of wine, and we had a great time trading knowledge of local slang and laughing over Audrey’s hilarious retorts. I’d repeat them, but you had to be there. I decided to have a party for all of the counselors, Agustin and the kitchen staff who have been feeding us. Thursday’s the day and the menu is Mexican! You’ll probably be invited along as well. Here are my very few photos from today: Click on them to enlarge and read the captions. The kids did great in their dance. The choice was very pale or very ruby red due to the reflection off the tent canopy, so the dental hygienist looks very nursey indeed. Agustin regaled us with hilarious stories and Audrey quipped back The wine by the way, was great! If you can read the label, try it out. The best Mexican vintage I’ve tasted. If you ever come to San Juan Cosala and want to pass as a native, just utter the word, “Uta!” Karen will roll her eyes, but Maria will get a kick out of it. The kitchen staff must have been chosen for both looks and talent. This entry was posted in Camp Estrella San Juan Cosala, Uncategorized and tagged Agustin, Agustin Vasquez Calvario, Camp Estrella, children images, Judy Dykstra-Brown Photos on July 28, 2016 by lifelessons. Once again, click on first photo and then on the right side of each photo that follows to see photos full size with captions. Spoils of the day..masks and cards brought in for the night from where they’d been placed in the sun to dry. The tacos were a hit. . . The final mask was completed. Mask making and card making continued. Cynthy had some secrets to tell. This entry was posted in Camp Estrella San Juan Cosala and tagged Activities for children, Camp Estrella, Children, images of children on July 28, 2016 by lifelessons. Do they look like they are having fun? Talks on animals and visits by abused dogs that wound up with a happy ending, finding out how to care for their pets, singing songs, learning how to “twist and shout” and dance to “What’s New Pussycat,” being silly, making masks, eating burritos. All-in-all a happy and full day. Now for day two! Their performance that celebrates the end of camp will be at Viva Mexico at 3 o’clock, Saturday, July 30.Please call 387 761-1058 for dinner reservations if you wish to attend that performance. A hat will be passed to help fund next year’s camp, at which time we hope to include a second week of camp in El Chante. This entry was posted in Camp Estrella San Juan Cosala, Uncategorized and tagged Camp Estrella, Camp Estrella 2016, Children, images of children on July 26, 2016 by lifelessons.